Lush coniferous forests flourish in the rain of the West Coast. Richard Cannings. 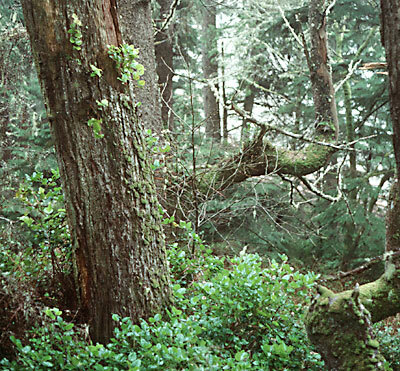 Wet Forests flourish along the windward slopes of the Coast Mountains. Curtains of moss hang from branches, ferns sprout from huge trunks and deer trails struggle through a tangled undergrowth of Devil's Club and Salmonberry. The temperate rain forests of British Columbia are as awesome as any forests anywhere. These rain forests receive most of their rain from November to March and so are dominated by huge evergreen conifers that can grow through the mild winters. This ability to grow throughout the year makes them one of the most biologically productive environments on earth. Salal grows on a Western Hemlock snag. Sydney Cannings. The Western Hemlock is supremely adapted to this cool, wet forest. Its roots spread like a mat just beneath the soil surface. Because nitrates are readily washed by rain from these acidic soils, hemlocks have developed the ability to use ammonium as a source of protein-building nitrogen. 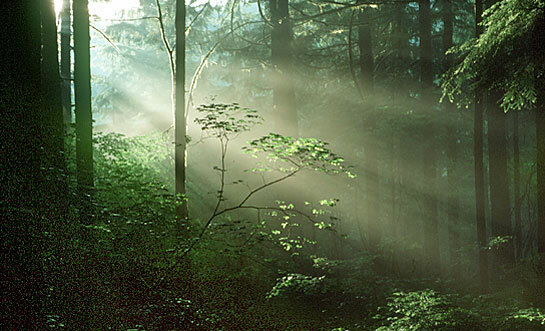 Their seedlings are also tolerant of shade, and hemlocks are often the only tree species regenerating on the floor of coastal forests. Western Redcedar is another characteristic tree of Wet Forests. Because its scalelike needles do not have a waxy coating, Redcedar loses water easily through transpiration and can grow only where water is readily available year-round. 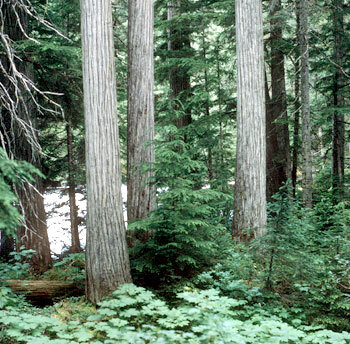 Western Redcedar is a common tree in British Columbia's Wet Forests. Its wood and bark were vital to the culture of the coastal First Nations. Sydney Cannings. Sitka Spruce prefers the rich soils of river valleys, estuaries and the misty spray zone along the ocean. Fast-growing, living up to eight hundred years, this tree can dominate any neighbouring hemlocks, most of which die before they are five hundred years old. Most dense mixed stands of Sitka Spruce and Western Hemlock are undergrown by hemlock seedlings, but spruce takes over quickly if canopy openings appear.